January 1 marks the start of a new year. So why not make a splash? The Polar Bear Dash provides a fun 5k course for runners to test their speed and then an optional dip in Lake Michigan after the finish line to test their courage. Make no mistake – it will be cold no matter what the temperature is on race day but we know a lot of you pride yourselves on being able to take whatever Mother Nature throws your way! Below, Race Director Bill Schneider tells us more about this year’s race, including a new contest that just might get you to take the plunge. Get race specifics on our Featured Races page . What makes the Polar Bear Dash different from other 5k races in the area? The Polar Bear Dash is the first race of the New Year. Why not start the year off on the right foot…then the left? It is a winter race taking place on New Year’s Day morning with an indoor heated packet pickup and post-race gathering area. The unique part of the race is an optional dip into Lake Michigan right after the finish line, which is located on the Grant Park beach. Runners who take a full dip in the lake are eligible for prizes. The race is run entirely in Grant Park in South Milwaukee on a completely closed-to-traffic route. There is no better way for runners to start the year off. Our charity partners are the National Multiple Sclerosis Society. We also have hot chocolate at the finish line! New this year will be a contest to see who enters the water in the best and most creative way. Every year we take video of runners jumping into the water; this year we will choose 5 or so of the most creative ways people get into the water and post the video on our Facebook page. Our Facebook friends will then vote to determine which one they like the best and that person will receive a free entry into the next Polar Bear Dash. We are also looking into having a bonfire on the beach to help warm up those runners who do decide to brave the water as well as for the friends and family that come to watch the excitement on the beach. What are the course uphills, downhills, turns, etc. that runners should know about? The course begins at the Grant Park Clubhouse and finishes down at the beach. There is a small uphill at the beginning and then a beautiful run through the park. The race finishes with long downhill to the beach. If the roads are clear of ice, this can be a very fast course. If there is snow, runners need to be more cautious. Who were last year’s winners? Are any of them back to contend for the win again this year? Last year’s overall winner was Mike Treder with a time of 17:57. The female champion was Kelly Ryan with a time of 20:00. At this time we do not know if they will be defending their titles but we sure hope they come back. Is there anything participants should know about water stations, etc.? This race is only a 5K so unless the weather is unusually warm, there is not a water station along the course. We do not want to cause a slipping danger by having water spill onto the road. If the weather is warm, we will have an aid station along the course. Of course, there is plenty of water at the finish line in Lake Michigan. We do not suggest drinking that water, however. There will be hot chocolate at the finish line for all participants and snacks in the clubhouse after the race. Can you talk us through the dip into Lake Michigan – how does it work? How many participants have taken the plunge in previous years? Do participants have to take a dip to qualify for awards? 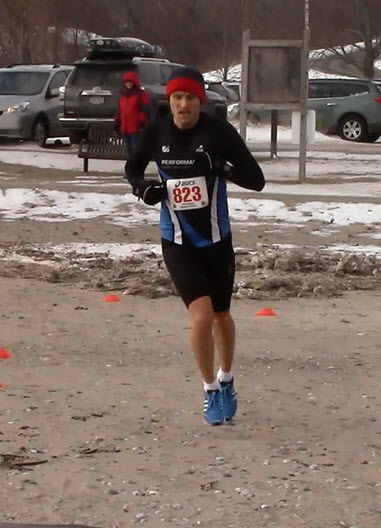 The finish line of the Polar Bear Dash is on the beach in Grant Park about 10 to 20 meters from the waterline. 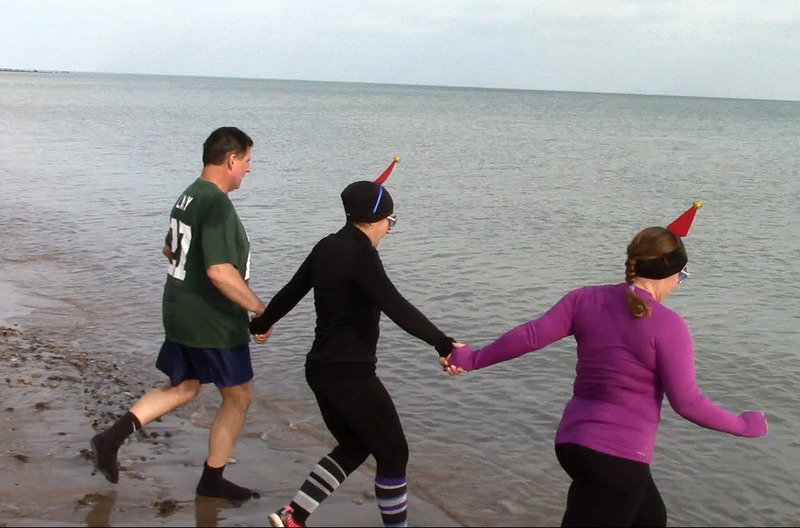 We encourage runners who are 18 and older to take a dip into Lake Michigan after the race to celebrate the New Year. However, this is completely optional. Awards for times in the 5K are separate from awards for the brave souls who jump in the water. We do have a drawing for prizes for those who decide to take a FULL DIP into the water. And by Full Dip, we mean entire body, head to toe. The South Milwaukee Water Rescue Squad has helped us every year with keeping the runners safe as they jump in the water. They will have two members in the water assisting anyone who needs help. We have up to about 40% of the runners jump into the water depending on the weather that day. 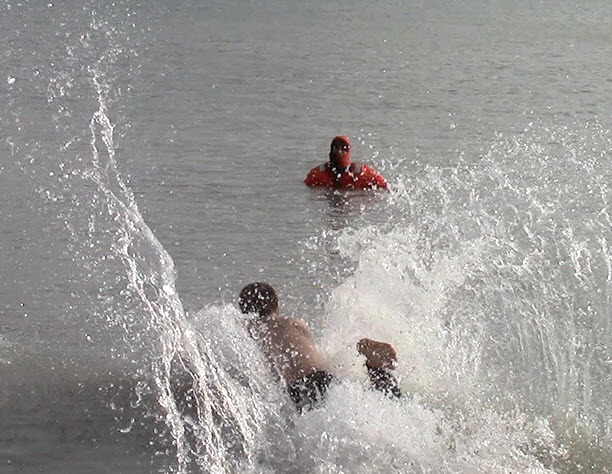 Last year we had great weather for a dip with temps in the 20s and low winds. In other years, the winds were higher with temps in the single digits. We have less that go in on those days. It is a great site to see everyone going in the water. How do most people do their dip into the lake? What are some of the funniest/most memorable dips into the lake that you’ve seen over the years? I love watching the runners jump into the lake. There are many different ways people go in. Some just casually wade in and that is as far as they go. Some run in as fast as they can and after a few steps in, dive into the water. There is a lot of screaming that happens when the water hits their bodies. Some of my favorite ones in the past were couples running in together holding hands or the guy who did a cannonball last year. Costumes are always fun to see as well. In my opinion, the ones who run into the water are the best. Do you have any tips for runners planning to take the plunge? I think the best advice I could give is once you commit, do it quickly. Run in as fast as you can. The slower you go, the worse it is. Also, wear shoes into the water. It can be quite painful walking over the stones and ice with bare feet. Have dry clothes to change into right away once you are out of the water. Most importantly, have fun and make a great memory. We look forward to starting the New Year off on the right foot again this year and invite everyone to make their way to Grant Park on New Year’s Day to participate or spectate. Everyone who participates is helping not only themselves, but also the National Multiple Sclerosis Society. We hope to see you out there. Thanks for chatting with us, Bill! To learn more, or to sign up for the race, visit http://www.polarbeardash.com/. This entry was posted in Race Previews and tagged Milwaukee Races, Polar Bear Dash, Race Previews, Running in MKE, Upcoming Events. Bookmark the permalink.